The beauty of nature can be found in the unique surface of each of these elegant and sophisticated stone beverage coasters. Ever piece that you see below was formed by mother nature herself, and the colors and patterns found in the surface were not added to in any way by any human hand. The surface of these absorbent sandstone drink coasters is a complex array of tones and hues, which contains every errant color of a dessert at twilight all merging and forming against one another to create the multicolored display you see in every piece. The fossilized formations found in the surface of these stone coasters are all entirely natural, and foirmed deep within the belly of a mountain over millions of years, untouched and unsees by any human. 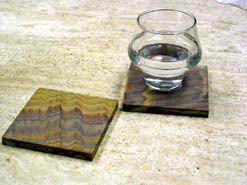 Rainbow sandstone is one of our most popular drink coasters, and it is easy to tell why. The unique array of colors all contrast and contend to create an unusually delightful surface which is unmatched by any pattern formed by the human mind. 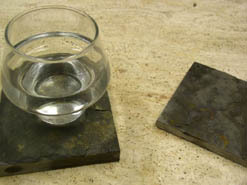 Naturally absorbent, these coasters are a beautiful piece of real stone decor. 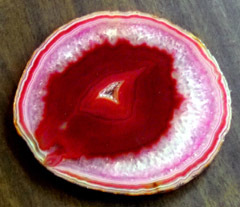 Ruby is an array of red clouds moving endlessly across the surface of a solid sandstone piece. Beautiful hues and tones merge and meet within these coasters, creating an orchestra of red whose resultant beauty is hard to match in anything but a natural piece. The natural surface of these lovely Moondyne drink coasters is a subdued backdrop of endless subtleties, with complex minute details emerging amongst the overall wash of endless dessert spaces. 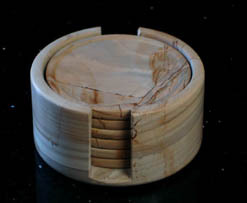 A beautiful and functional piece of a mountain range, available in your home. If you are looking for a piece of the natural world to incorporate into your home, there are few materials that are as rugged, primal, and real as slate. Its textured surface is flat enough to hold a beverage steady, but has enough depth and minute detail to keep the eyes mesmerized for hours on end, as you melt into the colors of the stone. 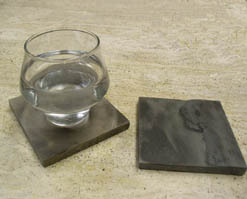 The Earth natural slate beverage coasters contain, as the name implies, a multitude of earth toned stone colors, all merging and melting, to create a truly stunning spectacle of natural art. These tones are broken only occasionally, by brilliant beams of red and sunset orange, which lace through the scenes, setting fire to more subtle tones. Gold blush coasters are a merged collage of green and brown earth tones, broken by brilliant rays of sunlight, which alight upon the surface of the stone, to create illuminated contrasts throughout the piece. 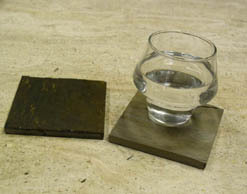 Made for durability, slate coasters are some of the most resilient pieces available on the market. 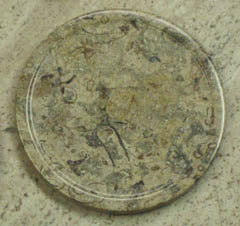 The natural surface of these exotic Brazilian slate coasters, is a sea of midnight clouds, which merge and part with one another to create a million deep black tones throughout the unique face of the piece. Every single coaster is made unique by these features, and yet they all match with one another as the black tones reach out to connect with their own. 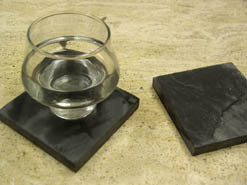 It is just about impossible to stain the stunning surface of these natural slate, multicolored beverage coasters. Midnight black is burst asunder by golden tones, and orange red bursts, which collide in fiery chaos to create a piece of renowned beauty. Best of all, if you do get some juice to actually stain these resilient pieces, you will never know, because the multicolored beauty is only enhanced with added color. The multi, in multi china drink coasters, refers to the multicolored hues which break through the slate surface of these gorgeous functional accessories. These colors, comprised of reds, and golds, yellows and blues, all collide and contrast in a beautiful dance like array, to form one of the most unique pieces of home decor that you will find anywhere in the world. 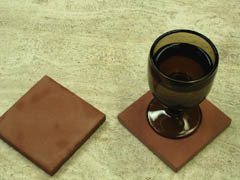 The red earth slate drink coasters have a stony surface that is comprised of a multicolored array of deep dark red hues, all of which merge to create a hazy and beautiful surface that is beyond the skill and temperament of any human hand. 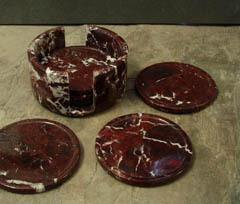 The cinnabar sandstone drink coasters are a beautiful example of the lovely multicolored materials which can be quarried from mountains in the southwestern United States. 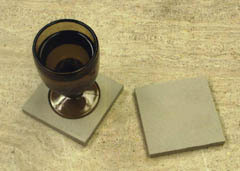 A delicious collection of sandstone hues , browns and creams with tan haze resting over the surface, is the hallmark of these unique coasters. 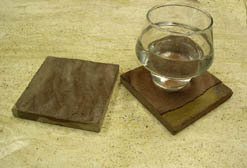 These coasters are named picture sandstone because of the unique pictures which actually form naturally within the surface of the sandstone pieces. These pictures are created based on the chemical formulation of the stone, and are one of a kind, and unique in each and every individual piece that we offer in each set. The surface of these gentle hazy sandstone coasters is a soft array of hues, like the glare from a sunset in the dessert with your eyes half closed. But through that glare, you can just make out the multitude of colors which exist just beyond the horizon of the piece. 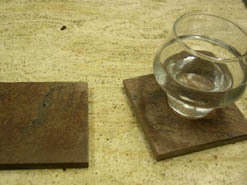 The natural beauty of real sandstone is stated, plain and simple, in the surface of these unassuming beverage coasters. Made up of a million points of textured contrast, all arranged in a chaotic pattern and draped over the subdued earth tone tans of a beige backdrop. An excellent subtle piece that is highly functional, without being flashy. 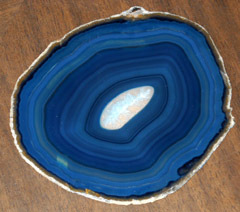 Onyx is a gorgeous semi precious material that has been used in jewelry and fashion accessories for centuries. It is now available in a polished and refined multicolor form, as a set of elegant drink coasters that can grace the delicate surface of your finest possessions. The fossil stone drink coasters are special, and unique, because visible right in the surface of each and every coaster are the real, imprinted outlines, of creatures and plants that lived on this earth millions of years ago. While these are not actual fossil, the dendridic imprints do give you a glimpse into a long forgotten world, which was much more primal and savage than anything we now know. Teak is a subdued, multicolor. A bit of an oxymoron, it is made subdued by the gentle tan colors which dominate the earth tone surface of the polished pieces. 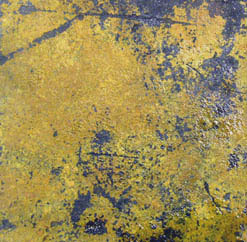 However, the multicolor comes into play when brilliant flashes of bright brown lightning rip across the surface of the stones, creating a brilliant pattern of unique natural beauty. 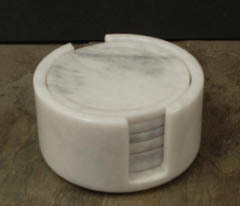 Cloud marble was appropriately named, because the surface of these sophisticated subdued coasters is a gently billowing array of cloud like formations, whites and grays, which drift lazily through the polished glistening surface of the stone. 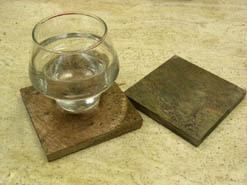 The result is a set of beverage coasters that screams of sophistication, with a gentle, and refined voice. Deep crimson red hues are at war with one another. They commit to battle, deep maroon tones clashing with lighter, brighter, more violent hues, to create a spectacular vision of powerful red sophistication. This already violent scene is ripped asunder, white streaks of lightning billow across the surface of the stones. 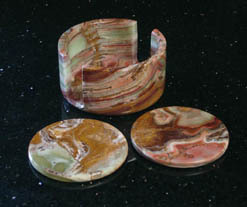 A hazy green mist hangs forever entrapped within the surface of these stunning gemstone coasters. This greenish mist has an almost magical property, as it seems to dance and lilt across the stage of agate, and yet, remain ever unchanged within its polished surface. A great way to evoke a nature themed ambiance, or simply to bring a spot of vibrant, unique, and elegant color into your setting. 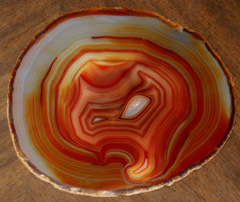 Amber swirls travail the multicolored patterns which have formed naturally within the gentle surface of these elegant polished agate drink coasters. Hundreds of hues burst naturally through the surface of th stone to contrast with one another in wild and erratic dances of light and tone. Powerful colors, taken directly from the earth and delivered to your home. The delightfully playful pink hues which wind in twisting natural patterns throughout the surface of each coasters, gives them a one of a kind personality, a playful, yet dignified spirit, which brings the natural beauty of these decorative and functional pieces to life. Bursting blasts of liquid fire emenate from the core of these powerful natural drink coasters, creating a surface of flame and fury, passion and contrast which will stand out as an eye catching piece in anys etting. 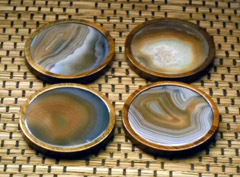 Functional and elegant, these coasters are each made from unique pieces of mountain born, semi precious agate. 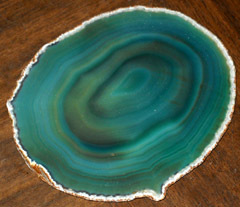 Swirling hues of blues twist and twirl around and through the surface of these semi translucent, natural agate coasters. 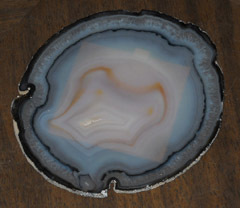 The result is a powerful collection of contrasting colors, which creates a completely unique, one of a kind picture in the surface of each and every agate coaster that we offer. These stunning multi colored drink coasters are imported from Brazil, and feature a wild variety of colors and hues bursting and contrasting through the surface of each perfectly polished piece. This wild array of twisting colors is bordered and contained by the hardwood loop that rests around its outer edge, acting as a protective lip against spills and slips.